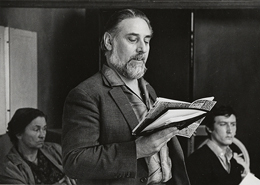 Concrete poet, arts organiser, publisher and printmaker Bob Cobbing (1920-2002) is best known for his performed works in which language is anarchically stretched and dismantled through the deployment of shouts, groans and hisses, interspersed between more recognisable tracts of spoken word. He made innumerable publications and prints, visual scores that blur the distinction between decipherable text and abstract imagery. Bill Jubobe, an excerpt from a line written by Cobbing's friend and collaborator François Dufrene ("Bob jubile et, bien sur, à la langue, Bill jubobe"), highlights the interrelation between Cobbing's live performance and his experiments on paper. A live programme of film, music and reading will accompany the exhibition, as well as a contribution by artist Benedict Drew. Bill Jubobe is curated by William Cobbing and Rosie Cooper, and is part of Bob Jubilé: a year-long series of events and displays that explore and present the legacy of Bob Cobbing, culminating in a publication with Occasional Papers. Bob Jubilé is supported by the Arts Council, Elephant Trust, Henry Moore Foundation, The Estate of Barry Flanagan and the Exhibition Research Centre, Liverpool. Bob Cobbing reading 'Are Your Children Safe in the Sea' c.1966-1972.